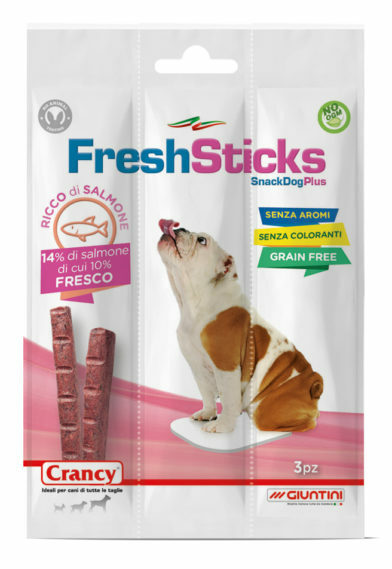 Crancy Fresh Stick can be given at any time during the day. Remember to always leave a bowl of fresh, clean water available for your dog. Dog's weight: Small (3-18 kg): 2 sticks, Medium (18-30 kg): 5 sticks; Large (>30 kg): 10 sticks. Meats and animal derivatives, Fish and fish derivatives (Salmon min. 14% of which min. 10% fresh salmon and min. 4% hydrolysed), Minerals, Oils and fats, Derivatives of vegetable origin (crude fibre concentrate from natural lignocellulose), Vegetables. Moisture: 26,0%; Crude protein: 36,0%; Crude fat: 18,5%; Crude fibres: 4,0%; Crude ash: 14,2%. 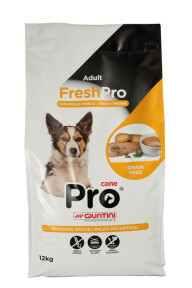 Fresh Pro with Fresh Chicken Grain Free is a highly palatable, complete and nutritionally balanced food with protein from fresh chicken. 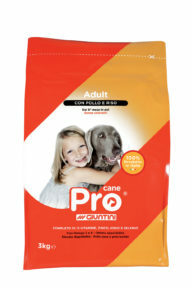 Pro Chicken and Rice is a complete food for dogs, highly palatable and nutritionally balanced, with protein from chicken.